BestBear.co.uk offers a unique service in this category. It is a database of childcare agencies that have been carefully selected through a thorough screening process. 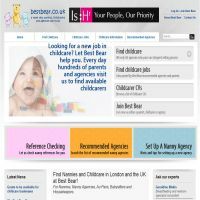 This means that the agency childcare candidates have been checked firstly by an agency and then the agency has been checked by BestBear.co.uk. This is different from the other websites in this category because many of them allow individuals to advertise as babysitters without any screening process other than basic website monitoring. It may be the preferred option for those looking for an agency, and allows parents to search through individual candidates' CVs as well. As with the other database type websites, the individuals who advertise their CVs are not vetted and can join for free. However, BestBear.co.uk offers a reference checking service through the website for an additional fee (see above). This is the most personal service offered from this kind of website reflected in this category and makes sound sense. Relying on a computer database to check the credentials of a person who will be responsible for the welfare of your child is not a good idea. If you use a website to find a childcarer you will have to do this yourself, which could be daunting if you have not employed someone before or are short of time. This could be the economical choice for people wanting a quality service without the price of going to an agency directly. The reference checking features allows for peace of mind when looking for childcare. BestBear.co.uk provices a full written report with detailed findings within 7-10 days of request. The benefit of hiring the website team to check references on your behalf is that they have experience in the field and will be able to ask the best questions and have an eye for details to watch out for. Also, if they call on your behalf it creates a more formal approach when contacting employers and individuals. This kind of work can be tiresome and it can take perseverance, so hiring a company to produce results can take a load off your mind in the stressful job of finding appropriate childcare. This would be particularly beneficial if you are looking for a regular babysitter to hire and get to know, so might be worth the investment rather than having to start from scratch each time you look at new profiles online. The team of experts working for Best Bear are Geraldine Miskin, a specialist consultant in breastfeeding and newborn babies; parenting consultant Roni Jay; Lisa Barnes who specialises in homeopathy; Mary Elder specialising in childcare, Elaine Lambe, education consultant and healthy eating and cooking consultant Christine Bailey to name but a few. These people can be contacted through the website with questions you might have in their respective fields. The individual CVs available to view online are plain text with no photo. However, if you take advantage of the reference checking facility and of the experienced team of experts, this may well be better value for money than subscribing to a website that has no childcare knowledge and bombards your e-mail inbox with a barrage of computer generated updates. Why not see the difference and try BestBear.co.uk?